Committed data is pre-purchased data and charged at the rate of $1.10 per GB. Shared data rates are suited to most people as our network is always kept under 30% saturation. Read more on our network. 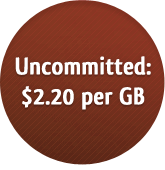 Uncommitted data is overage data and is charged at the rate of $2.20 per GB. For those wanting a dedicated line we can offer a fully redundant, Australian wide network with a 99.95% data SLA. Dedicated data is currently available in our Melbourne CBD and West Melbourne data centres as well as 90% of Australia data centres. Services can be delivered Australia wide with last mile via Fibre, DSL or MicroWave. Ensure your business never slows down with our uncontended 1:1 burstable data plans. Plans are based on usage and are burstable to 100 Mbps (1 Gbps available).